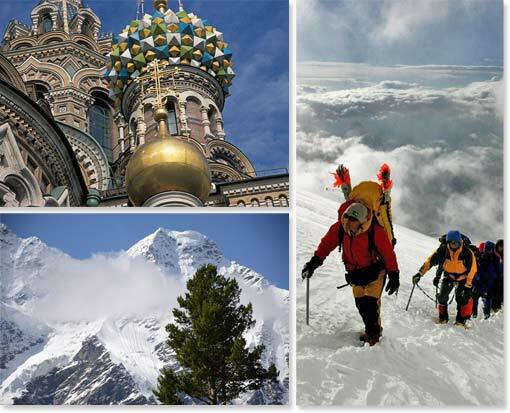 Why Climb Mount Elbrus with Berg Adventures? We know Russia! Wally Berg has been leading expeditions on Mount Elbrus since 1994. Our experienced English-speaking Russian guides and support staff have been with us for many years. High-altitude experience and emergency equipment. We carry emergency oxygen, expedition first aid kits and pulse-oximeters on all climbs. Most importantly, our staff of seasoned guides knows how to use this vital equipment. We also carry satellite phones and radios, and are in contact with our home office every day. Internet dispatches and communication. Each day our expedition team reports back to the head office with an update on the day’s activities. These daily reports are posted on our website along with photos so that friends and family can follow along as you climb. We also provide you and your family with a 24 hour emergency phone number should your family need to reach you while you are away. Excellent food and private cooking staff. Each Berg Adventures expedition team includes a skilled cook to ensure the quality and variety of our meals. At every meal and snack we provide an array of fresh foods to keep appetites strong. See our FAQ section for a sample menu. We are happy to cater to your dietary needs. No middleman. At Berg Adventures we organize and operate our own trips to ensure the highest quality of guides, services, and equipment. Finest accommodations. 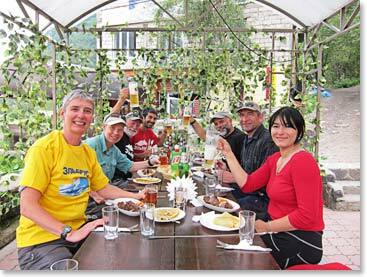 We stay in beautiful and hospitable lodges in the Caucasus Mountains of Russia. High on the mountain of Elbrus, you will stay in “The Barrels” which are comfortable cabin-style accommodations – far more luxurious than a tent! In St. Petersburg and Moscow, we stay in gorgeous hotels located in the heart of each city so that we can easily walk to all of the iconic sites including the Hermitage and St. Basil’s Cathedral. Trip training and gear outfitting. We provide training tips and services to help you get in shape. We will also assist you with finding the right gear. Gear purchasing services are also available. Team spirit. 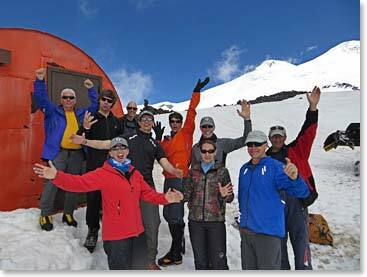 We firmly believe that team morale plays a large role in getting you to the summit. The positive energy of the BAI staff is sincere and contagious. Complete support is with you on the climb. Our staff are our family. We treat guides and support staff like family. Many of these people have been with us since the beginning of Berg Adventures and we keep in touch with them regularly throughout the year. Don’t take our word for it! Refer to the client testimonials to see how much people love climbing with Berg Adventures. You can also read about past expeditions in our archived dispatches.